IMPORTANT It is imperative that personnel responsible for the operation, and all operators of the ® Belchfire equipment, read and understand these instructions prior to lighting and use ® of Belchfire torches. The Belchfire® Gas-Air series torches are designed to operate with natural gas or propane, propylene, or MAPP gas, plus air supplied by shop air compressor systems. WARNING: DO NOT USE ACETYLENE OR OXYGEN WITH THESE OR ANY OTHER BELCHFIRE® TORCHES HOOK-UP. Maximum efficiency will be obtained if air and gas lines are at least 1/2” I.D. for the Model 4F torch. Air and fuel gas lines should be connected to torch fitting as shown on mounting bracket (Figure 1). Gas fittings are 1/2” NPT for Model 4F. Gas line pressure can be 1-25 PSI, as long as the withdrawal rates of the fuel used are not exceeded. Gas connections should be made only to a regulator designed to operate with the fuel gas to be used. Air pressure should be 80-120 PSI. As with all fuel-burning torches, there is a certain amount of hazard involved with the operator and his use of the torch. 1. Use supplied striker and position at rear opening of Combustion Chamber (Point “A”, Figure 1). ® Belchfire torches have a completely flexible flame which can be adjusted to suit any purpose. The size and type (lazy, long, neutral, oxidizing, etc.) of the flame is controlled by adjusting the valves (air and fuel) clockwise to decrease flame size and shut off, and counter-clockwise to increase flame size. When operating properly, the combustion chamber will be cherry red forward of the ignition point. ® Belchfire torches will eventually require servicing or replacement of parts due to wear from normal use. All maintenance should be performed by authorized ® Belchfire service personnel. All repairs made by this personnel are fully guaranteed against defective material and workmanship. Repairs made or attempted by anyone other than this personnel cannot be guaranteed. ® Should any questions arise about the Belchfire torch, feel free to write or call us at any time. In any communications, please give model number of the torch. 3. With the striker in position , push in button on automatic shutoff valve. 6. If after releasing the automatic shutoff valve button the flame does not remain ignited, turn gas valve clockwise to stop. Repeat steps 1-5 and hold automatic shutoff valve in for 40-60 seconds. If flame still does not remain ignited, turn gas valve clockwise to stop. Contact factory for further instructions. When in operation, if flame is extinguished momentarily and does not reignite, the thermocouple will cool down and signal fuel shut-off valve to close (approximately 30 seconds). Air supply will have to shut off manually. If the above happens, a restarting procedure must be started to reignite torch. Any other repair requirements should be sent back to the factory for service. Add “TC” to combustion chamber part number when using the optional auto shutoff valve. FOR YOUR SAFETY: NEVER attempt to light torch that is pointed into a vessel where gas can accumulate. Point torch outside the vessel and reposition only when flame is established. The Belchfire tube burner is designed to operate with propane or natural gas plus air supplied by shop air compressor systems. WARNING: Do not use acetylene or oxygen with these or any other Belchfire torches. Maximum efficiency will be obtained if air and gas lines are at least 3/8” I.D. Gas and air fittings are 1/2” NPT (Female). Gas line pressure can be 1-15 psi. If regulator is required, use one that is designed for type of fuel being used. Air pressure should be 50-120 psi. As with all fuel-burning torches, there is a certain amount of hazard involved with the operator and his use of the torch. All normal safety precautions associated with this type of equipment should be observed. When lighting the tube burner, each tip has to be lit individually. Open gas valve slowly 1/3 turn counter-clockwise. Light the tip closest to mixer first and proceed lighting the next one until all tips have a flame. Once all tips are lit, slowly open air valve counter-clockwise 1/3 turn. The Belchfire tube burner has a completely flexible flame and can be adjusted to suit any purpose. The size and type of flame is controlled by adjusting the valves. Valve stem can be tightened or loosened by adjusting the stem nut under the handle. Clockwise tightens; counter-clockwise loosens. The Belchfire Tube Burner now allows a user to heat long sections of material with a single mixer. Belchfire supplies the mixer, tips and tip adaptors. The user supplies the tube section. The tube section, square of round, should have a minimum 1 size of 1½”, and for welding the top adaptors to the tube, a minimum wall thickness of /8”. Weight and ease of handling must be considered when deciding on the tube size. After the tube is cut to desired heating length, drill ½” holes at each tip location. Place the tip adaptors in the hole and weld them to the tube. 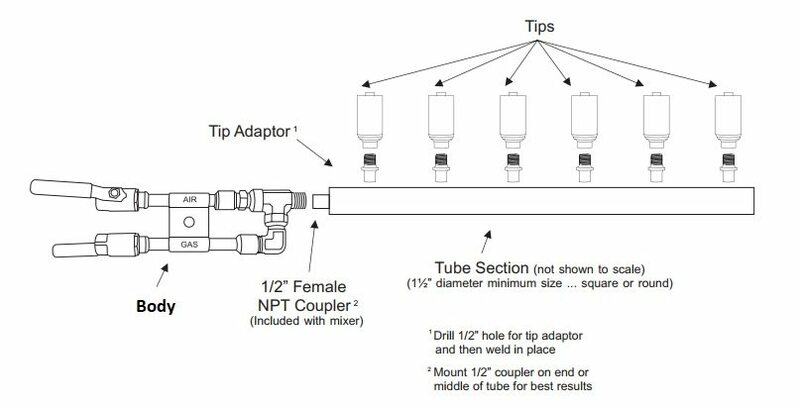 The tip adaptors allow the tips to be threaded on to the tube. The mixer requires a 1/2” NPT female fitting. A hole must be drilled in the end cap or the middle of the tube section to accommodate the fitting. Place the fitting in the hole and weld. For longer tube sections the mixer can be mounted in the middle for a more even distribution of air-gas mixture. The mixer uses Belchfires unique technology to increase gas flow to maximize BTU output. End caps now can be welded to the tube. Once all parts are welded to the tube, the mixer and tips can be installed by threading them on. All normal safety precautions associated with this type of equipment should be observed. In addition, check all welding joints for leaks.